In recognition of her tireless service to IUPUI and of the role she has played in the 50 years of impact IUPUI has had on a local, national, and global scale, Becky Porter received with the IUPUI 50th Anniversary Chancellor's Medallion by Chancellor Nasser H. Paydar on January 24, 2019. This is the second Chancellor's Medallion Becky Porter has received. The first came on May 14, 2018 at the Deans' Recognition Reception. 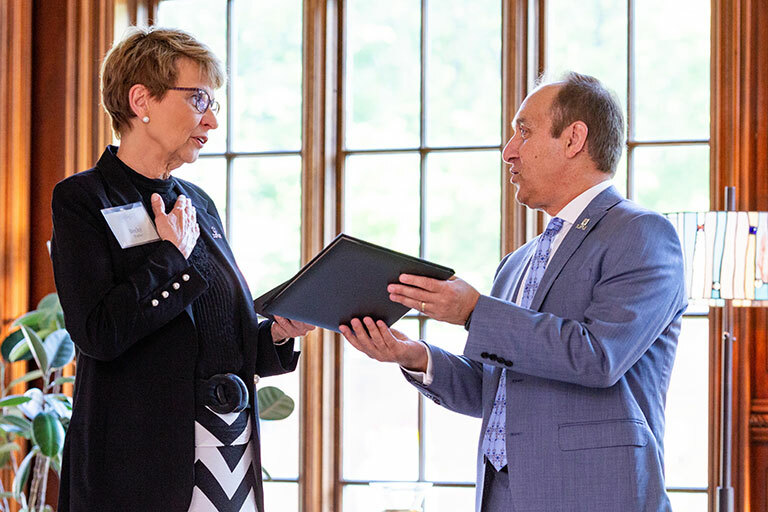 There Chancellor Paydar honored Porter on the occasion of her retirement as Interim Dean of the School of Health and Rehabilitation Sciences. Dr. Porter joined IUPUI's faculty in 1977 and has served in variety of leadership positions across campus, including assistant director and director of the Physical Therapy Program in the School of Health and Rehabilitation Sciences, and associate vice chancellor, leading the Division of Enrollment Management. During her tenure with Enrollment Management, Dr. Porter oversaw record-breaking enrollments at IUPUI and worked to ensure that student services met the increased demand. In addition to her leadership roles, she has also served as an associate professor of physical therapy. Dr. Porter's service to IUPUI includes terms as vice president and president of the IUPUI Faculty Council. While serving as president, Dr. Porter was instrumental in the planning for the campus-wide Task Force on the Status of Women, chairing the committee whose work resulted in the formation of the IUPUI Office for Women. Dr. Porter also helped to author the strategic initiatives grant that initially funded that office. Dr. Porter has received numerous awards, including the Frances C. Ekstam Award for Outstanding Contributions from the American Physical Therapy Association Indiana Chapter, the Lucy Blair Service Award in recognition for outstanding contributions to the American Physical Therapy Association, and the Federation of State Boards of Physical Therapy Outstanding Service Award.